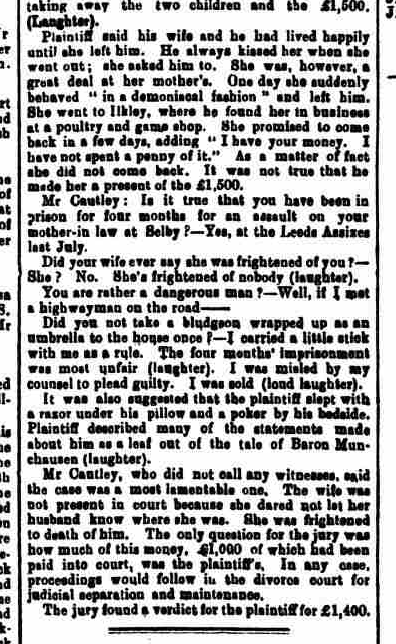 The first part of the accounti of the Hearing at York Assizes in 1902 as given by the Shipley Times, 7/3/1902. 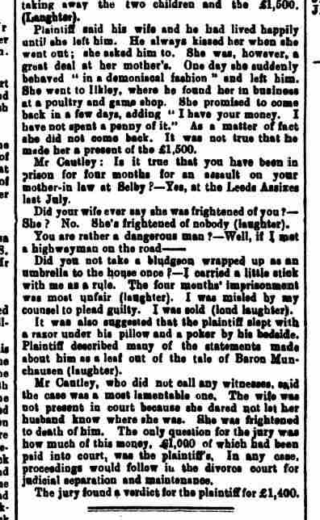 Second part of the account of the Hearing at York Assizes as given by the Shipley Times, 7/3/1902. 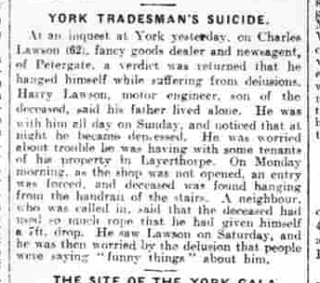 Charles Lawson's death in June 1923, as reported by the Yorkshire Post. 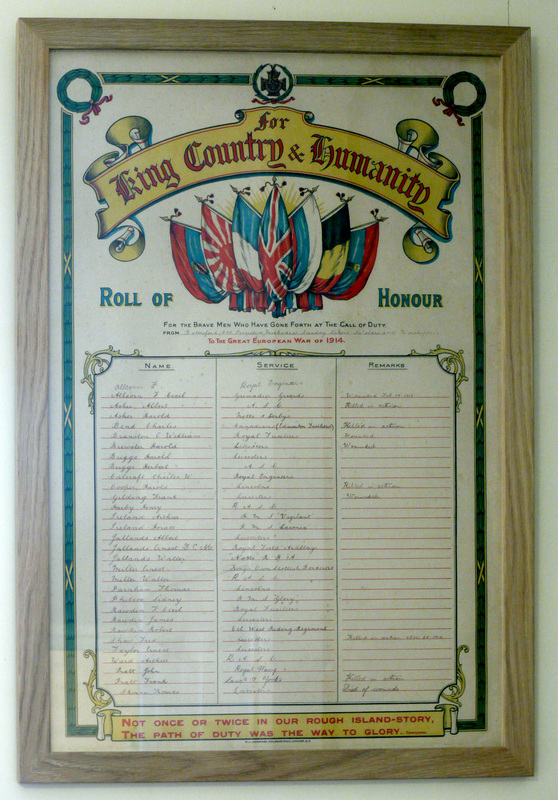 The Bottesford Methodists Roll of Honour records the names of thirty men who fought in WW1. The names are in alphabetic sequence, except at the end, where three names were added to the original sequence. Two of these ‘late’ additions were John and Frank Pratt. John is described as ‘Royal Navy, and Frank as ‘Lancs & Yorks’ … ‘Killed in action’. Frank is not mentioned on Bottesford War Memorial. Neither he nor John are included in the ‘church list’ of Bottesford servicemen, yet it is important that they be given due recognition. It has been a difficult and intriguing task to find out who John and Frank Pratt really were, and the results are to a degree speculative. Difficulty arises in confirming the identity of the boys’ mother, Florry Pratt. It appears that this was not her real name, and that her sons were likewise using a false surname. The Pratts were really called Lawson, and their use of a false name seems to have been an attempt to disguise their whereabouts from their violent father, Charles Lawson. Frank Pratt was really Frank Lawson, and John Pratt was really Wilfred Lawson. Service records for both men have been located as outlined in this article. Frank served in the Sherwood Foresters and was killed on the Somme in July 1916. Wilfred was in the Royal Navy from 1916 until 1928. Their father died in tragic circumstances in 1923, but the mother Emily Lawson lived until 1941. This looks straightforward. The address was next the Post Office in the census, indicating a house either immediately west of, or opposite, the Post Office, in the central part of the High Street. ‘Ford’ refers to the town of Retford, Nottinghamshire. Florry is Marian’s daughter. Frank and Jack are her sons. They are the men named on the Roll of Honour. Florry’s husband was not included suggesting that he was not there on census night. However, there is a problem with regard to the identity of Florry Pratt. Census records make it clear that Marian Ellis did not have a daughter called Florry or Florence, so who was the Florry in the census and why was she recorded as Marian’s daughter? In the census of 1871, Marian Ellis (nee Ward, b.1836), lived with her husband Thomas in Heworth, part of York. They had married at Retford in 1855, and by 1871 had six children including 10 year old Ada M., who corresponds with Marian’s daughter Ada Saunders who was recorded visiting in Bottesford in the 1911 Census, but none of the children was called Florence or Florry. In 1881, the family had moved to Scotland, and were at 3 Taylor Place, South Leith, Midlothian. Thomas was now a chemist. There were five children with them. The oldest was Ada Maude Ellis, now 20 years old, single, employed as a confectioner. The youngest was 10 years old Emily T. (Teresa), who was born in 1871 or 1872, the year that Florry had stated that she was born. By 1891, Thomas had died. Marian had returned to York and lived on Scarcroft Road, now a 54 year old widow working as a confectioner, as were the two daughters living with her, Lillian May (b.1869) and Emily Teresa. By the Census of 1901 it seems that Marian had fallen on hard times. She was living at Selby, Yorkshire, in a house owned by a ‘van and wagon builder’ called Thomas Stagg who came from Australia. Marian, now 65, was his housekeeper, and was being visited by Eva Ellis (another of her daughters, b.1867), but none of Marian’s other children were present. None of these censuses mention a Florence Ellis. The nearest child in age would have been Emily Teresa, born in 1872. Therefore, the question arises as to who was the Florry Pratt described in 1911 as a daughter of Marian Ellis? Was Florry Pratt her true name, and could she have been Emily Teresa in reality? The register of Yorkshire Marriages (held at the Borthwick Archives, University of York) includes the Marriage Certificate for the wedding of Emily Teresa, daughter of Thomas Ellis, to a man named Charles Lawson on the 27th May 1896 at St Clement, Clementhorpe, York. She was 25 years old, and lived at Scarcroft Lane, York. Charles Lawson was born in 1862 and, in 1881, lived with his parents Henry, a 58 year old brushmaker born in York, and Caroline (55) from Hull, at 53 Bilton St, York. There were three children, Charles (19, an apprentice shoemaker), Lucy (16) and Arthur (13). In 1882, Charles married a woman named Rachel Denison at York, and by the 1891 Census their address was at Petergate, York, where the household consisted of Charles (29), now a wholesale toy warehouseman, Rachel (31), a son named Henry (8) and Charles’ 23 year old brother Arthur, another wholesale toy warehouseman. Sadly, Rachel died in 1892, leaving Charles a widower with a young son to support. In 1896 Charles Lawson married again. His new wife was Emily Teresa Ellis. Yorkshire Baptisms (held in the Borthwick Archives) record that a boy named Frank Lawson who was christened on the 2nd May 1897 at Clementhorpe, York, the son of Charles and Emily Teresa Lawson (and therefore a grandson of Marian Ellis). If Emily Lawson became Florry Pratt, then Frank would have been of the right age to become Florry’s son, Frank Pratt. Records of the second son called John (Jack), born in 1899, in Yorkshire, to Emily and Charles Lawson, have not been located so far. He may have been born in another county, or his birth records may have been lost. In the census of 1901 we find Charles Lawson (39) at 41 Petergate, York, a news agent and toy dealer, accompanied by his son Henry, 18, a railway engine cleaner (Henry was Charles’ son by his first wife Rachel). There is no mention of Emily or of any children born to Charles and Emily since their wedding in 1896, yet Charles describes himself as a married man (rather than a widower), implying that Emily was very much alive. In the 1911 Census we again find Charles Lawson, now 49, still describing himself as a married man, at Low Petergate, York, a toy dealer living on his own. Emily is again absent. What has happened? The explanation comes in press reports from March 1902, especially that in the Shipley Times on which this account is based, of a case at York Assizes in which Charles Lawson sued his wife Emily Teresa Lawson for £1500. This would have been a very large sum in those days, and it was not made clear how he came by it. 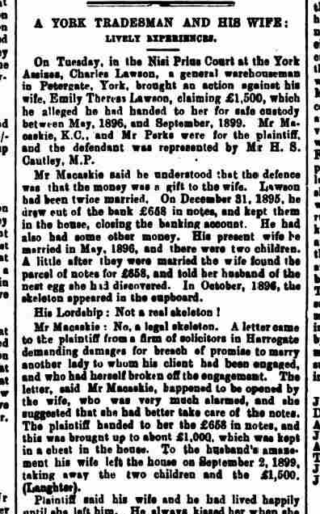 However, it was stated that he had entrusted it to Emily, as cash, in part to evade demands for compensation from the family of another woman who he had contracted to marry and then broken the contract by marrying Emily. The report makes it clear that Emily was a strong minded woman who stood her ground against her husband, and that she was supported by her mother. Emily was not present at the trial. She had said that she dared not go to court, and that she was ‘frightened to death’ of her husband. At court, she was represented by the distinguished barrister Henry Strother Cautley, then the Conservative MP for Leeds East. Charles Lawson stated that he did not know her whereabouts. Emily had taken their two young sons and the money she had been looking after. She had gone to Ilkley where she had been found ‘in business at a poultry and game shop’, but she did not then go back to him, and did not disclose her whereabouts after that. It emerged that Charles Lawson had attacked his mother-in-law (Marian Ellis) in 1901 and had served a four month sentence for this offence. It was also reported that he had taken a bludgeon to their house, and that he slept with a cut-throat razor under his pillow and a poker at his side. At the end of the hearing, the jury found for Charles Lawson and awarded him £1400, most of which had already been surrendered to the court. There was an expectation that ‘proceedings would follow in the divorce court’, presumably referring to matters such as the custody of their children, but there is no certainty that this ever happened. Indeed, the fact that Charles Lawson continued to describe himself as married in the 1911 census suggests that it did not. Where was Emily at the time of the trial? She may well have been with her mother Marian Ellis at Selby. Another possibility arises from the 1901 census, where there is a record of a woman named Emily Lawson, married, 30 years old, at Whiston, Rotherham, and employed by Richard Shaw, a 53 year old dairyman, and his wife Eliza, 51. There is no certainty that this is the estranged wife of Charles Lawson, but it could be. In any case, it clear that Emily Lawson (nee Ellis) left her husband Charles Lawson because he was violent, took her two young sons, and did not tell him where she had gone. She had also taken the large sum of money that he had either entrusted to her or given to her. He took her to court to recover the money, in which he was successful, though we don’t know if he ever in fact got all of it back. These facts fit the notion that Emily went with her boys to live with her mother in Bottesford, where she adopted a false name, Florry Pratt. They may have chosen Bottesford because they had no connections there, and it would have been somewhere her husband was unlikely to find her. In this explanation, Emily Teresa Ellis married Charles Lawson in 1896 and they had a son Frank in 1897 then a second child called Wilfred late in 1898. The marriage did not work, and they split up. Emily took her two young sons and went to live with her mother, renting a house at Bottesford, where they had no connections, and were living there in 1911. As an additional step, Emily could have assumed the name Florry Pratt. The boys were known as Frank and Jack Pratt in Bottesford, which is how they were recorded in the Methodist Roll of Honour. 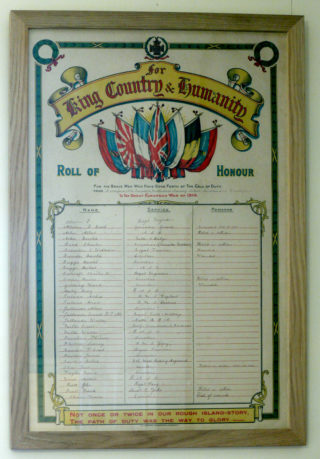 A search for a soldier named Frank Pratt in the records of the Commonwealth War Graves Commission yielded several records, but none of these were connected with Lancashire or Yorkshire regiments. However, Frank may have used his real birth name, Lawson, when he enlisted. A search of military records on this basis gave three outcomes that should be considered. 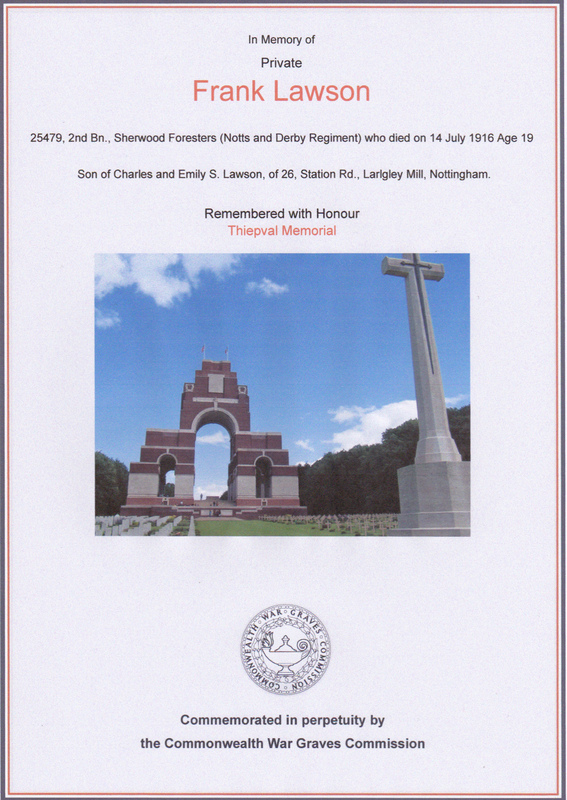 The first was Frank Lawson 27232 Private 1st/4th Battalion, Loyal North Lancashire Regiment, died 30th November, 1917, commemorated on Cambrai Memorial Louverval. However, a record for this man was located in the Forces War Records (FWR) website, which states that he was born in Wigan, Lancashire, and resided at Blackburn: his is therefore unlikely to be the soldier being searched for. The second was Frank Lawson 265819 Rifleman 2nd/7th Battalion, West Yorkshire Regiment (Prince of Wales Own), died on the 10th April, 1917, and commemorated on Arras Memorial. There is a FWR record of this man, which gives his place of residence as Leeds, making it unlikely (but not impossible) that he is the soldier being searched for. 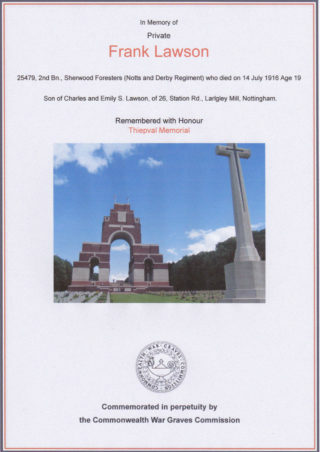 The third was Frank Lawson 25479 Private 2nd Sherwood Foresters attached to the 1st Lincolnshires, died 14/7/1916, aged 19, born at York, parents Charles and Emily S. Lawson, of 26, Station Rd., Langley Mill, Derbyshire, commemorated at Thiepval. The identification of the parents is strong evidence that this is the man who had lived in Bottesford in 1911. The address in Derbyshire implies that Emily and Charles had been re-united and had gone to live at Langley Mill. The record also indicates that Frank had served in the Sherwood Foresters, not the Lancs & Yorks as stated on the Roll of Honour. Perhaps the Pratt/Lawson family had left Bottesford before the start of the war and there were errors in the information about Frank’s death that reached the village in 1916. A search for a John (Jack) Lawson among WW1 military records gave 150 hits in Find My Past, but none were for men from the navy. A search using the name John Pratt did locate two sailors. One of these was for R/5992 RN Division, born on the 24th May 1899, his residential address at Northampton. The other was for a sailor from County Cork, Ireland. Neither is indicated to have had any connection with York, or with Bottesford. However, another line of enquiry is suggested by information in the 1939 Register, that Emily had a son called Wilfred who was born in 1898. 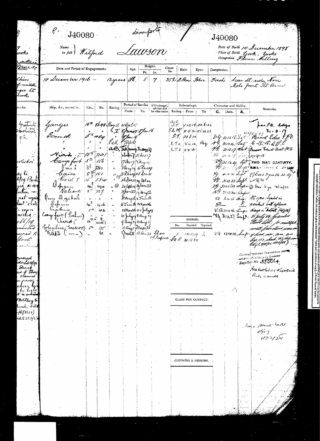 He could have been the boy called John Pratt in the 1911 census of Bottesford, and the service record of a sailor named Wilfred Lawson was located. He was J40080 ABS Wilfred Lawson, whose naval career started on the 14th December 1916, after the death on the Somme of his brother Frank, and lasted until December 1928. No post war records of John Pratt or John Lawson have been located. He is not on the list of Bottesford Electors in Spring 1919, and it seems unlikely that he returned to the village after discharge from the navy. However, his is a common name (in either form) and therefore difficult to trace with certainty beyond Bottesford. No post-war records of Florry Pratt have been located, consistent with this being a false name used by Emily Lawson. Emily appears to have returned to live with her husband Charles Lawson some time between 1911 and 1916 (when their son Frank was killed), and they lived at Langley Mill, Derbyshire. 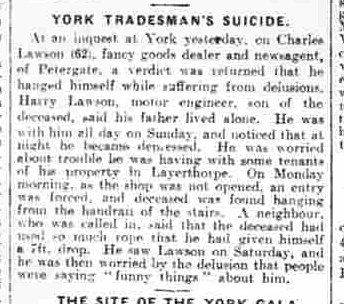 Charles Lawson died in tragic circumstances in York, in June 1923.The Yorkshire Post of the 20th June 1923 reported “York Tradesman’s Suicide”, stating that Charles Lawson, 62, a fancy goods dealer and newsagent of Petergate, York, hanged himself. His son Harry Lawson said that his father lived alone, and was said to have been suffering from delusions. This is almost certainly Emily’s husband. They must have separated again, with Charles returning to York while Emily remained in Derbyshire. In the Register of 1939 there is a record of Emily T Lawson, widowed, born 8th June 1871, living at Hassock Lane, Belper, Derbyshire. Also at this address was Wilfred Lawson, an electricity worker born, in 1898. Wilfred’s relationship to Emily is not indicated, but his age suggests that he may be the second son of Emily and Charles, and that while in Bottesford he was the boy called John Pratt. The address at Belper is not far from Langley Mill where Emily and Charles had been living in 1916, suggesting that Emily had stayed in the district after Charles’ death and been joined there by her surviving son Wilfred after he left the navy in 1928. The BMD General Register records that Emily T Lawson died in 1941 at Ilkeston, Derbyshire. She would have been 69 or 70 years old. There are also possible records of the death of Marian Ellis, Emily’s mother, in 1921 and 1926, both in Derbyshire. This page was added on 28/12/2016.